I'm Rabbi Steven J. Mason, a Reform Rabbi of humanistic leanings who has created a specialty rabbinate in ministering to the needs of the interfaith community. I am also a Justice of the Peace and can provide civil ceremonies. I invite you to learn more about me and my credentials in the "About Rabbi Steve " section. 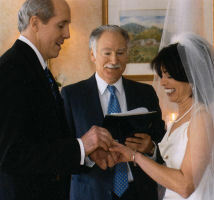 If you desire rabbinical or Justice of the Peace services, including interfaith marriages, I welcome you to contact me at 860-659-2698 or through my "Contact Info" page. Please use the links on the left side for detailed information including Interfaith marriage ceremonies, naming ceremonies, civil unions/weddings, as well as other services I offer. Some of your questions may be answered on the "Frequently Asked Questions" page and I encourage you to contact me directly. I welcome the opportunity to chat with you.